I was in the mood for a stick-to-your-ribs kind of soup last week, and set out on a quest for something to fulfill my craving. After combing through piles of books and magazines, I settled on this one-pot meal that I found stashed in my own recipe box from a number of years ago. I really don’t know where I got the recipe from, but it’s a good one! It’s chock full of ham, bacon and kielbasa (a spicy Polish sausage). This is a real meat-lovers’ soup for sure, and believe me, it will stick to your ribs. I love the smoky undertones of the pork hocks and the garlicky punch of the kielbasa. All of these more intense flavours are balanced by the creamy green peas and fresh herbs. Add a thick slab of your favourite bread and you have a super-hearty meal, sure to ward off the chill of the winter season. 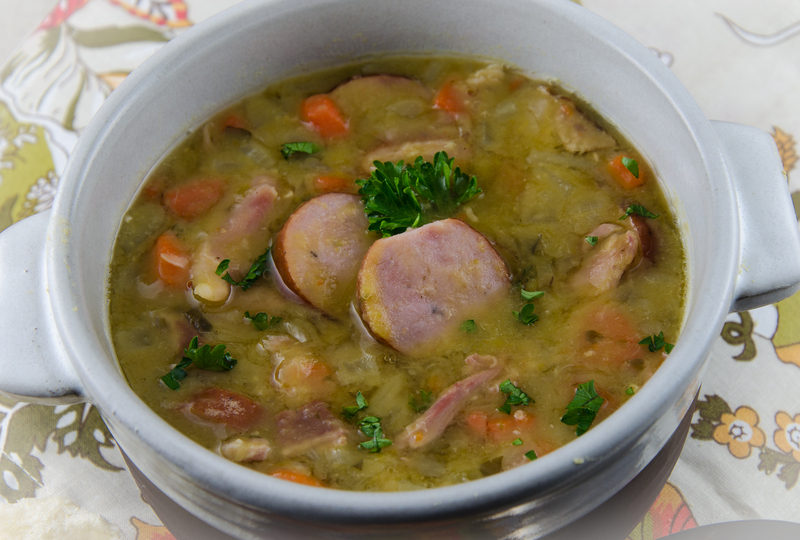 I’m bringing a big pot of my pea soup over to Angie’s Fiesta Friday tomorrow. I know that winter is being particularly nasty to many of my blogging buddies this year. Maybe one of them will find some solace by tucking into a piping hot bowl of this yummy soup. If you haven’t joined us yet at Fiesta Friday, please do at The Novice Gardener. I know you will be thrilled, and will probably want to visit each week, like so many of us do. Hope to see you there! Now this is a stick-to-your-ribs kind of soup! Rinse the peas in a colander. Place in a large soup pot and cover with cold water. Soak overnight. Drain the peas. Wipe the ham hock down with paper towels. Put the peas and the ham hocks in the soup pot and add the chicken stock. Bring to a boil. Reduce heat and simmer, covered for 45 minutes. Place the bacon in a large skillet and fry until crisp. Remove from the skillet and allow to drain on paper towels. Remove all of the bacon fat except for 1½ tablespoons. Place the onions, celery, carrots and green onion in the skillet and sauté until the vegetables become just tender. Add the vegetables, parsley, rosemary and bay leaf to the soup pot containing the peas. Bring to a boil. Reduce heat and simmer, covered for about 2 hours, until the ham hocks are fork tender. Remove from the heat. Remove the ham hocks from the soup and place on a working surface. Remove the skin and bones and shred the ham. With a large spoon, scoop the fat from the top of the soup. Chop the kielbasa into about 6 pieces and add to the soup, with the shredded ham and the bacon. Bring to a boil. Simmer, covered for about 30 – 40 minutes. Check for seasoning and add salt if necessary. To serve, remove the kielbasa from the soup and slice thinly. Place the soup in bowls and top with kielbasa slices and croutons if desired. The meat lovers in your family will jump for joy! Oooh, love how meaty your pea soup is and the fact it is a one pot recipe. Looks delicious. 🙂 Hope it goes down a treat at your dinner party. I love that you have a good mixture of meat – including pork hocks. Super nutritious and super yum. So glad you think so, Hilda! It really is a tasty soup! Now THATS what i am talking about! great soup!! Can you shortcut the pea soaking bit at all? Haha, I thought you would like this one, Mr. Fitz! I think you can shortcut it by not soaking and just cooking the peas longer. I have done that before. Yeah…. this couldn’t really look any better. Not only is it soup season, which makes this even better, but I would eat this in the blazing hot sun and LOVE it- pea soup is SOOOO good and you clearly know what you’re doing. 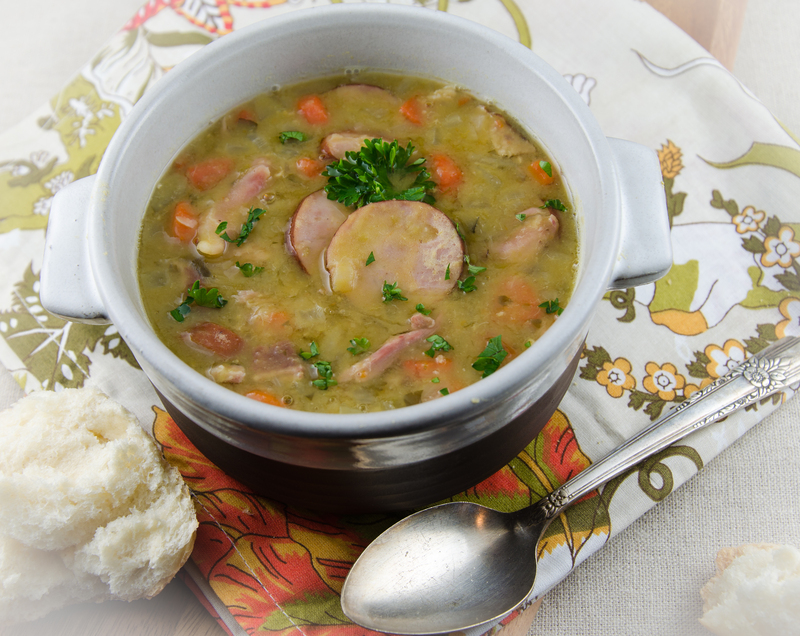 I make mine with ham… never tried Kielbasa but the polish in me says that sounds PERFECT! You’re right! It was kind of like pea soup on steroids! Pretty flavourful! So glad you liked this soup! Great idea of adding kielbasa! I have to try this!!! thank you! 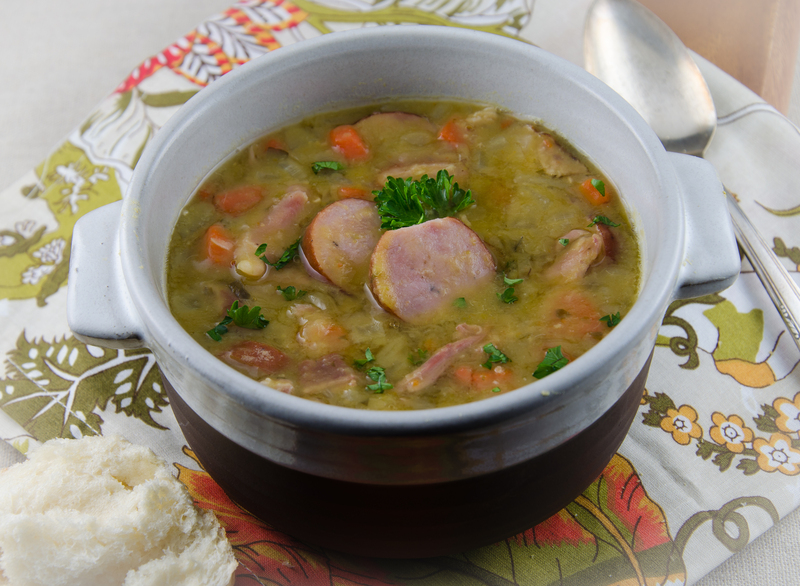 I have homemade kielbasa waiting to be used in the freezer and this soup appears to be what I was waiting for… looks fabulous… sounds delicious… and I think it would be the perfect remedy to combat Mother Nature! Love it, Julianna! I’m so happy you like this soup, Judi! Really looking forward to next week too! See you then! Julianna, This soup looks so~ delectable that I almost can smell its fragrance. Yum! Mmmm! Yes, Fae. My house smelled wonderful. Coming home on a cold day to that scent is the best! yummy – meat lovers soup – right up my street ! So glad! I know that this won’t appeal to everyone, but I’m really glad that you like it! I make a lot of lentils, and the pairing with Kielbasa is my favorite! Love this soup!!! Brilliant idea, Mimi! I do tons of lentils too, and will definitely use some kielbasa next time! This is a very heart warming soup Chef. I was wondering if I could substitute pork with some other meat, as I don’t eat pork. Ahh, a bowl of this will make me feel better in NO TIME! even though Winter’s not too harsh here (L.A. based) I still enjoy a good, hearty soup. this looks like a good one.